—The Motion of Puppets by Keith Donahue – This might be releasing during the upcoming RIP season? It would be a perfect RIP read though, sounds like! —Nevernight by Jay Kristoff – Might end up being a bit too gory for me, but we’ll see. Potential rereads include: The Night Circus, Gentlemen & Players, Jonathan Strange and Mr Norrell, City of Dark Magic, The White Devil, Lady Audley’s Secret, Jane Eyre, The Monk, We Have Always Lived in the Castle, Devilish, Rebecca, Phantom of the Opera. I definitely won’t get all those books read, but that’s a nice spread to start with. Let the festivities begin! 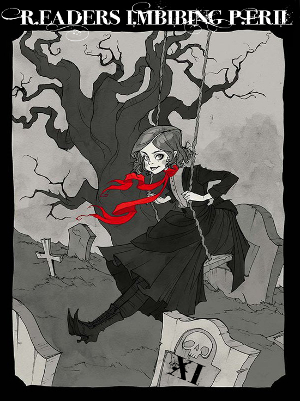 Thanks so much to Carl of Stainless Steel Droppings for hosting the event, and to Abigail Larson for amazing artwork! hm. I am reading Nevernight right now and it isn’t too bad. I mean it is about a group of killers so people die, but I think if anything was too gory it would stick out for me more because I am listening instead of reading. It might get gory as it goes, though. I am about halfway or so. Enjoy RIP! And of course, enjoy autumn in Wisconsin! Hopefully, the cooler weather will make up for the uncertainty in your life right now. All of your options look great. My favorite time of the year! Jonathan Stroud and Leigh Bardugo are on my “need to read” list! Why do I always miss them? Anyway, I do hope you find time for some great reads to complement your fall colors! I really liked Nevernight. The Creeping Shadow and The Croocked Kingdom will be being added to my list as well! Yes, much thanks to Abigail. She is very sweet to allow the art use every year. Congratulations on your move. I know you are going to love being there, most especially when you get all settled in. I’m sure you will be very busy but I do hope you can get some reading in, and/or some audio book listening while you unpack, get settled, and start to walk/run your new neighborhood. I love RIP! I have a stack of potential books on my nightstand right now and I plan on adding the Tana French to it.